The 100% natural Liquid Ozone daily moisturizer is formulated with ingredients that are studied for their ability to make skin appear more bright and fresh, making the cream ideal for those with dark spots, an uneven skintone or a dull complexion. 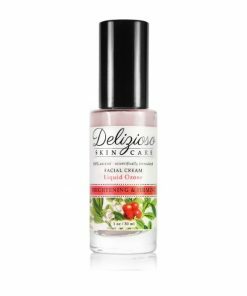 The scientifically formulated formula combines all natural skin brightening ingredients like Bearberry, Licorice, Kojic Acid, and White Mulberry. The lightweight moisturizer luxuriously keeps skin feeling more soft and hydrated throughout the day. After cleansing, toning and applying serum, apply the Liquid Ozone Moisturizer to full face and decollete twice a day. 1 oz / 30 ml – 3 g Travel Size. *Aloe Vera Gel (based on organic alginate from seaweed and Irish moss extract), Prunus avium (Cherry Kernel) oil, *Ribes Nigrum (Black Currant) oil, *Passiflora incarnata (Passion Flower) oil, Tocopherol (Rice derived non GMO Vitamin E), Vegetable Glycerin, Cetearyl Olivate and Sorbitan Olivate (Natural Olive Oil Emulsifier), *Rubus Idaeus (Red Raspberry) Seed Extract, *Punica granatum linn (Pomegranate) Extract, *Camellia sinensis (Green Tea) Extract, *Fresh Citrus limonium (Lemon) Juice, Kojic Acid , *Glycyrrhiza glabra (Licorice) Extract, Bearberry Extract, Morus alba (White Mulberry) Extract, *Rubus Idaeus (Red Raspberry) Seed Oil, Citrullus Lanatus (Watermelon) Seed Oil, Matricaria recutita (Chamomile Blue – Anti-Inflammatory) Essential Oil, *Cucumis Sativus (Cucumber) Seed Oil and Natural Antioxidant Preservative (Vitis Vinifera (Grape) Seed Extract, Populus Tremuloides Bark Extract, Leuconostoc/Radish Root Ferment Filtrate, Sambucus Nigra (Elder) Fruit Extract). I have allot of hyperpigmentation and dark spots on my face which have been bothering me for some time. I have been using this cream, the toner which comes with it and the luccuma serum and my skin looks allot brighter and toned which really surprised me. The product smells very fresh and absorbs well. I really like this.